Online discussions, rants, and observations are either alarming (and motivating) brand managers or fooling them into unforeseen enthrallment. But the reality is that real-time dialogue is fueling connections and perceptions in the statusphere, blogopsphere, online communities, and the social web in general. It’s this swelling tsunami of chatter that will only intensify and heighten as it forces a new genre of Social Customer Relationship Management (sCRM). Social CRM is no longer an option. 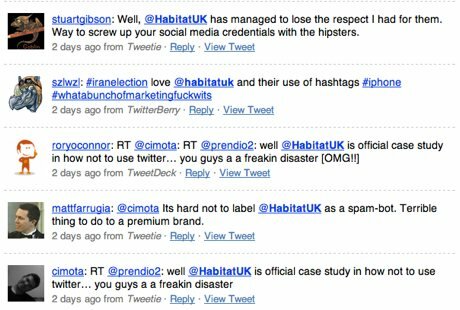 It necessitates brand involvement to proactively share answers, solve problems, establish authority, and build relationships and loyalty, one tweet, blog post, update, and “like,” at a time. In the world of business, social media, led by Twitter, is forcing companies to augment the offshoring of reactive customer service with the nearshoring of proactive customer engagement. The conversations that power social media are sparking a sense of urgency to identify influential voices and talk to customers in a place and time of their choosing (generally, in public and online). 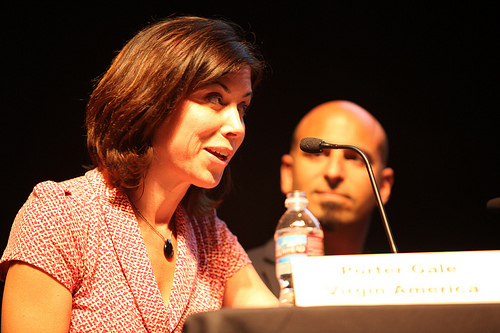 For example, on Friday at during a panel at the CrunchUp on Real Time Business, Porter Gale, vice president of marketing for Virgin America, made it clear that Virgin America understands the promise, prospect, and value of listening and responding to the social stream. Erick Schonfeld, who was moderating, asked Porter how her team mines Twitter for the perception of the brand and also for determining how they contact customers. With more than 20,000 followers on Twitter, Virgin America is galvanizing a vibrant and active community of people who will respond in “Twitter time,” thus alleviating the modest team from having to engage in every discussion, whether it’s positive or negative. 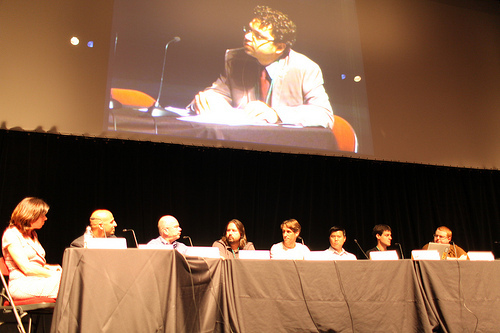 Everyone in the audience was a witness to a vivid demonstration of how interaction online extends into real world experiences. 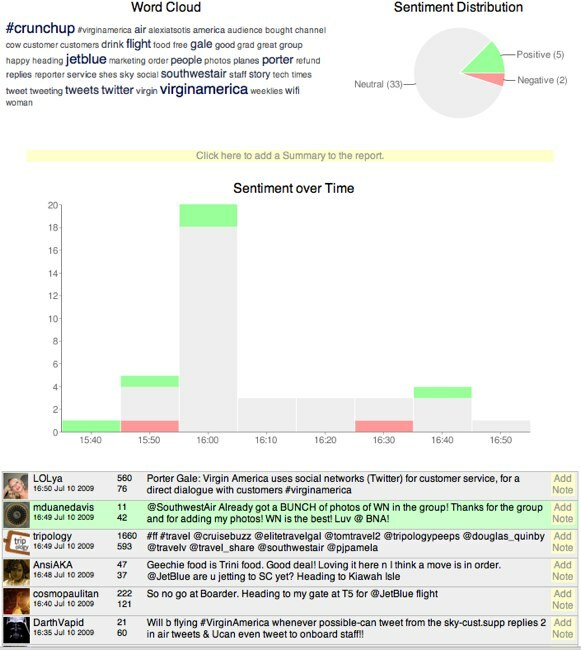 More impressive is Virgin America’s use of the social Web for real-time customer service. They’re actively monitoring issues, frustrations, and recommendations to solve challenges as they arise. In several such instances, Virgin America has used Twitter as a real-time guest service recovery system in flight to address concerns and problems by contacting service staff in the air to alert them to issues – again, the perils and associated benefits of offering inflight WiFi. Earlier in the day, Peoplebrowsr (disclosure: I am an advisor) showed a demo in which airlines were ranked by the sentiment expressed about each brand on Twitter, and Virgin America was on top. Peoplebrowsr highlighted the ability to analyze conversational sentiment by industry through the alignment of positive, neutral, and negative conversations and perception by brand. 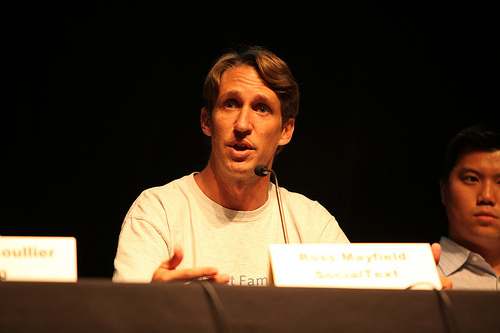 Ross Mayfield, CEO and founder of Socialtext, discussed the nature of the social dialogue enterprises are being pulled into and how conversations require more than one person or department to engage. SocialText offers a dashboard for enterprises that wish to collaborate internally with coworkers and externally with customers and stakeholders. Ross referenced the engagement iceberg, where he observes only a small portion of customer conversations and engagement as truly visible, with most occurring beneath the water line and thus, out of view. It highlights the reality that every department eventually needs to socialize. Social Media is, for the time being, tuning-in new channels of influence to incorporate into the brand and marketing mix. While it takes a station manager time to receive the signals and in turn, coordinate outward broadcasts, it is the divisions within each organization that will need to shift from an introspective support mode to an extrospective group of proactive collaborators. There are social networks, and there are tools with which to identify conversations and facilitate interaction, but everyone agreed, that in the world of new service and marketing, we need to improve the literacy and education among the teams who occupy the front lines. Monitoring the conversation is not enough. Brands need to jump in, but in a professional way.